An emerging concept in science and medicine is the microbiome, a term referring to a community of microorganisms - in soil, aquatic ecosystems, or associated with plant and animal hosts - which provide unique functional traits ensuring life on earth. These communities have only recently been appreciated as such. Lab experiments demonstrate what might be predicted by evolution theory, namely that in direct, controlled competition, one microbe ‘wins’ and takes over a culture, precluding microbiome formation. How then do microbes strategise their physiology and behaviour so that their co-existence is possible? Qualitative and quantitative descriptions of microbial communities have led to new insights from ecology and environment to agriculture and crop yield to health and disease. This Research Focus aims to take advantage of a comparative approach to identify common mechanisms concerning microbiome formation and functional stability and resilence. A second goal will be to understand how products of microbiota modify host organisms or environments. A long-range goal is to organise the local research community for future collaborative funding initiatives. 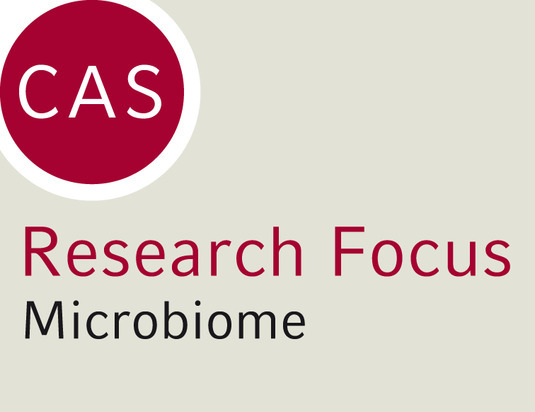 Please find video recordings of this Research Focus here: CASVideo – Microbiome. Lecture by Prof. Emeran Mayer, M.D., Ph.D. – "How Important is the Gut Microbiome for Our Brain Health?" Workshop – "Co-Evolution of Host and Microbial Communities" with Evening Lecture by Prof. Dr. Thomas Bosch – "The Holobiont Imperative – Insights from Simple Metazoans"
Lecture by Prof. Dr. Thomas Bosch – "The Holobiont Imperative – Insights from Simple Metazoans"
Lecture by Prof. Kwangwon Lee, Ph.D. – "Fitness in a Microbe: How the Circadian Clock is Shaped by the Environment"
Workshop – "Microbiome: Theory and in vitro Model Systems" with Evening Lecture by Dr. Petra Louis – "The Human Gut Microbiota – Metabolic Activities and Dietary Modulation"
Workshop – "Microbial Ecology" with Evening Lecture by Prof. Jack Gilbert, Ph.D. – "The Microbiome in Precision Medicine"
Workshop – "The Gut-Brain Axis in Health and Disease" with Keynote Lecture by Carlos Ribeiro, Ph.D. – "How Nutrients, Neuronal Circuits, and the Microbiome Shape Nutritional Decisions"
Workshop – "Plant Microbiomes" with Keynote Lecture by Prof. Philip Poole, Ph.D. – "Root Colonisation and the Role of the Microbiome"